Today, with it being both Tabby Tuesday and Charity Tuesday, we are sharing a tabby cat called Tabby to help him find a forever home. Tabby is a very handsome 9-year-old chap who has come to the shelter with his friend lovely friend Tibby. He is a little shy at the moment but would love a home where he can have all the attention he requires. Check out his profile to find out more about him! 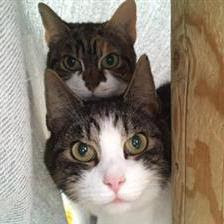 Tibby (behind Tabby in the photo), is also 9 and is a sweet little lady who is looking for a quiet home where she can have as much fuss and attention as she desires. Visit her profile to find out more about this pretty lady! Tabby reminds me a bit of my Dexter. Hoping they find their forever homes soon! Cuties! Wishing them both new homes quickly! Tabby and Tibby look very sweet. I hope these 2 cuties get forever homes soon.